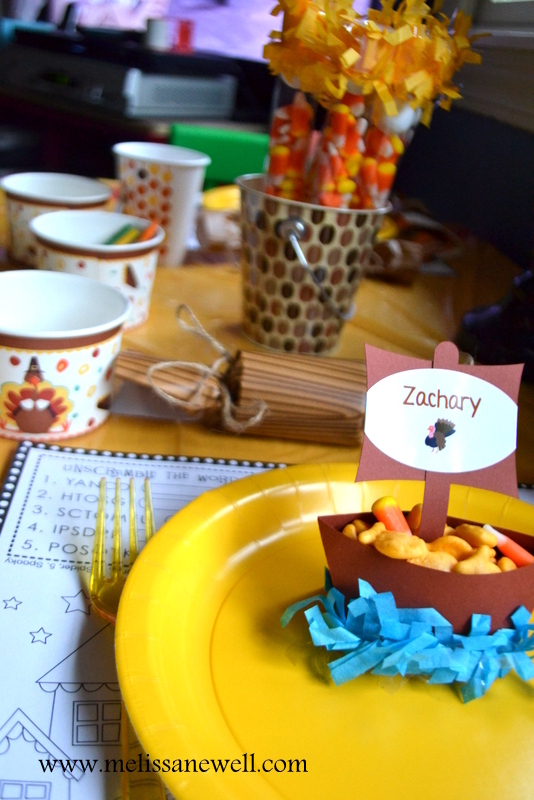 Melissa Newell from My Party Passion, and our budget party contributor, is back with some ideas on how to create a fun and inexpensive kids' table for Thanksgiving, something we all need! Happy Holidays to you all out there. Getting ready for Thanksgiving I assume? This Party Gal celebrated early this year with our BFF’s who came into town (during our power outage from Sandy, no less). 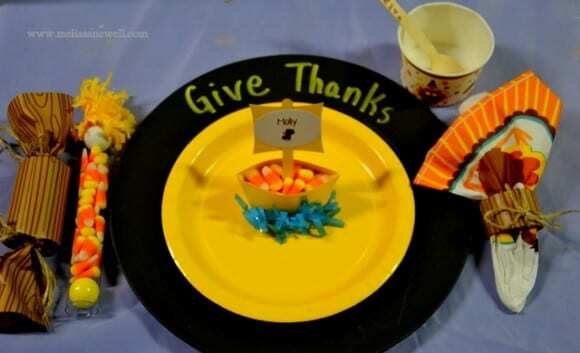 Today I wanted to share with you some ideas that are SUPER easy for your Thanksgiving Kids' Table. Table Setting – Let’s start with this. Keeping the children busy while their plates are prepared is KEY. Otherwise they get up and go back to playing and you are spending another 10 mins getting them back to the table! So I recommend using a roll of brown craft paper to use as their table covering. Put out some markers or crayons. (I pulled out NEW crayons that I had saved from my Back to School purchases – isn’t everything more fun with NEW sharp crayons?) Now they can draw and play tic tac toe until their plates arrive. Cost $ 1.00 for roll of craft paper at the dollar store. Makes for EZ clean up also! Well, if they are anything like my children, eating keeps them busy and out of my kitchen while I am preparing food! I am not talking a full blown buffet of snacks, but just some popcorn, trail mix, or carrots with dip in the middle of their table to share. Just enough to get them through until the meal arrives. I used little individual snack cups that I purchased at Target. 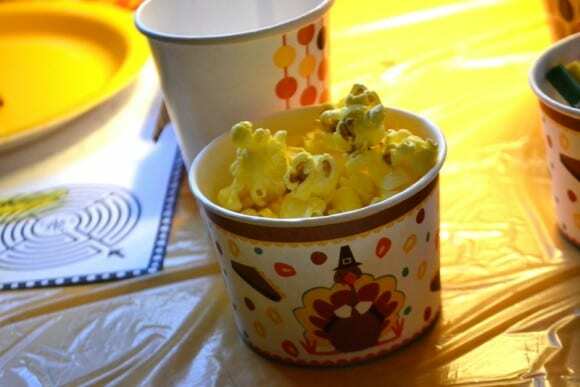 I put popcorn in them – reminds me of the Charlie Brown Thanksgiving movie. They gobbled that up and ate everything on their plates! A Favor/Treat – This year I made two “treats” for the kids to take home with them. One was SO easy your kids can help with it. Using toilet paper rolls or paper towel rolls, I put some tootsie rolls inside of them and wrapped them up with some dollar store paper and some jute around the ends. They looked SO cute on the table and the kids had fun ripping them open to get to their prize inside. The other item was candy corn tubes. I took plastic tubes and filled them with a gum ball at each end with candy corn sandwiched in the middle. They took these with them. Added a pop of color to the table and yummy later! 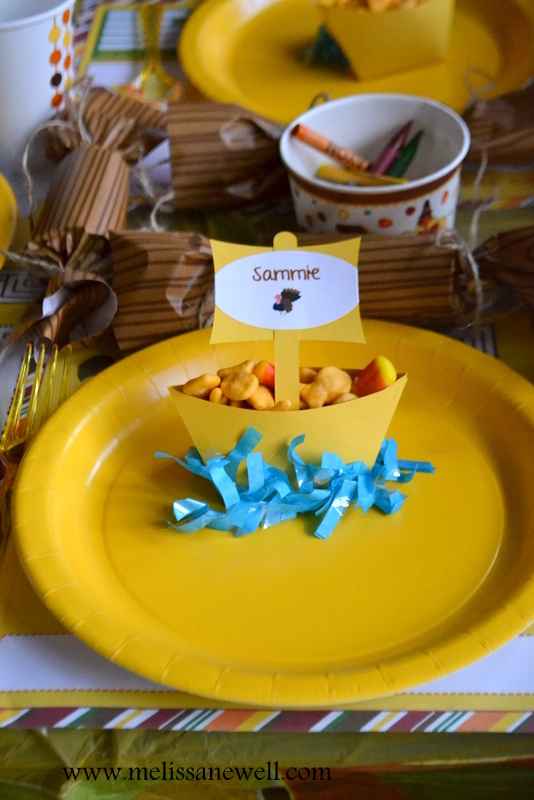 As an added bonus, the children each received their own Mayflower Place Card Boats. 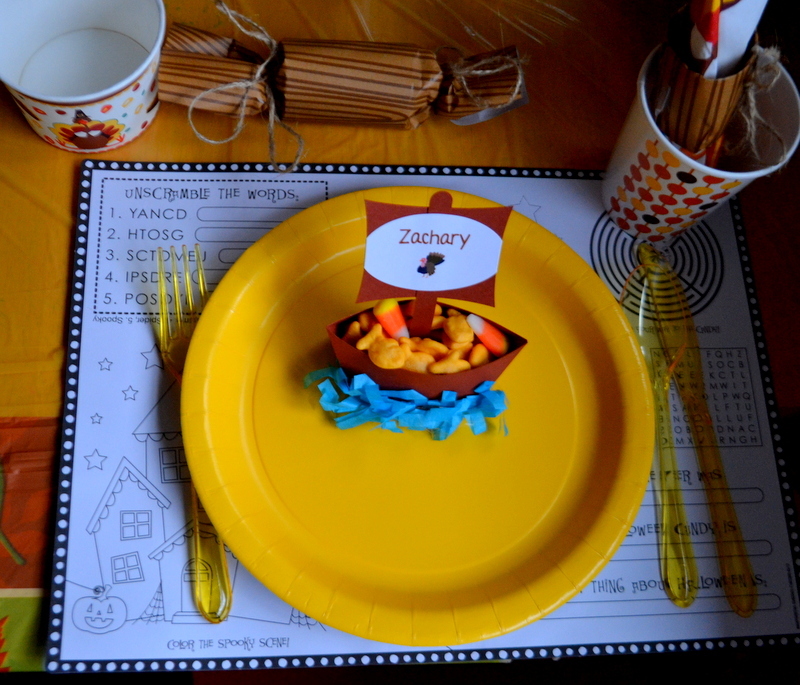 These name place cards doubled as a snack boat with some fishy crackers and a few candy corns hidden inside. I used my Silhouette SD machine to cut them out, put them together with glue stick and then added the sticker (using WORD and AVERY Stickers). I added the cute blue fringe at the bottom for the "ocean" effect. The fringe can be found at Party On Designs. Crafts – The last piece to the Kids' Table puzzle is a craft for AFTER dinner. After you have cleaned up but BEFORE dessert I like to have a simple craft for them. (Our kids seem to think that dessert is followed within seconds of clearing their plate.) This year I had purchased fall magnets for them to color and take home with them. This activity kept them busy while I cleared the adult table and prepared desserts. 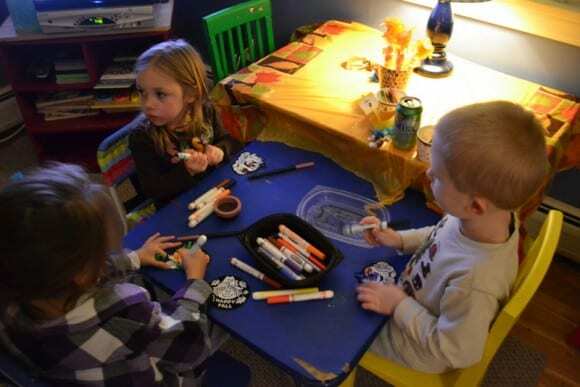 Well there you have it – my Kiddie Table for Thanksgiving on a budget. 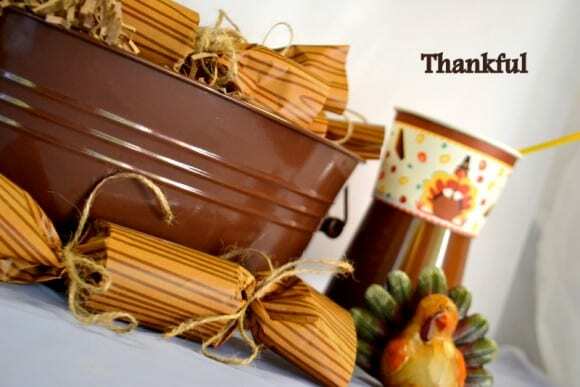 I hope you walked away with something you can incorporate into your holiday! Until December – Party on Friends! Thanks, Melissa, love the before dessert craft idea... brilliant! To learn more about Melissa, visit her at My Party Passion and find her on Facebook or Twitter.